Have you ever wondered if there might be more to Genesis than fodder for anti-evolutionism? Or have you ever thought, ""Revelation has to be more than simply a roadmap for the future of the Middle East""? You're not alone. 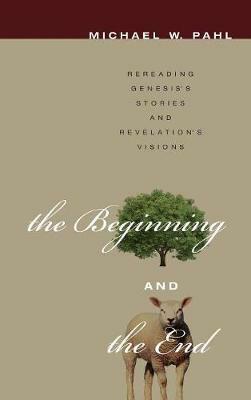 In The Beginning and the End Michael Pahl surveys the opening chapters of Genesis and the concluding chapters of Revelation, taking seriously both their historical and literary features as ancient texts and their theological purposes as inspired Scripture. The result is a reading of the first and last books of the Bible that sketches out, from beginning to end, a story of God, humanity, and all creation--a grand narrative in which we are placed in the middle, and which calls us to live in a particular way as our identity and our values are shaped in light of our origins and our destiny. ""Pahl leads his readers through a historical, literary, and theological look at the controversial-and commonly misunderstood-bookends of the Christian Bible. He does so not as an academic exercise, but as a faith-building journey. Pahl shows his readers that God's story ends where it begins. And that makes all the difference in how we see our own place in God's story."" -Peter Enns Biblical Scholar The BioLogos Foundation ""Can my students and other thoughtful believers be delivered from misguided misunderstandings of absolutely key texts in Genesis and Revelation? They can, if they are presented with a crystal clear, compelling, faithful alternative. That's what Michael Pahl gives us here. This little book will become a core text in my Theology of Creation course, and I hope also a core text for bible study in many, many churches."" -Douglas Harink Professor of Theology The King's University College, Edmonton ""The beginning and ending of the Christian story are perhaps the most hotly contested parts of our canon. Michael Pahl cuts through the morass of distracting debate, laying out an accessible approach to the narratives of creation and consummation. In doing so he also demonstrates how historically sensitive readings can feed the faith of God's people. The church needs this book."" -J. R. Daniel Kirk Assistant Professor of New Testament Fuller Theological Seminary ""This is biblical theology at its purest. Without imposing preconceived questions upon the text, Michael Pahl walks his readers through a discovery process leading to theological truths that directly impact our faith journey. This book honors the sacred text by embracing the fullness of its humanity, carefully considering issues of genre, historical background, and literary complexities. Readers will be intellectually challenged and spiritually enriched."" -T.C. Ham Assistant Professor of Old Testament Cedarville University Michael W. Pahl (PhD theology, Birmingham, UK) is a pastor at Lendrum Mennonite Brethren Church in Edmonton, Alberta. He has taught biblical studies and theology for over ten years in college and seminary settings in Canada and the UK, and is the author of From Resurrection to New Creation (2010) and Discerning the ""Word of the Lord"" (2009).